Traditional heating solution like hot air, steam and electrical heating apply the thermal conduction, heating convection and thermal radiation to heat the surface of material, gradually rise the temperature of core part of objective. However, for the poor heat conduction material, traditional heating method would take a longer time to reach the desired temperature. But, microwave heating method could directly core section of material which uses electromagnetic energy in the frequency 2450MHz, can be used successfully to heat many dielectric material without thermal conduction. Microwave oven is conveniently to operate, easily maintain, selecting heating methods. Comparing to other electrical heating solutions, microwave machine is a high efficient and energy saving unit. In addition, microwave machine is also an environmentally-friendly machine which do not pose environment temperature keep rising and produce any polluted air or water. According to different projects, we are able to customize the machine power and size to meet with our potential clients demands. 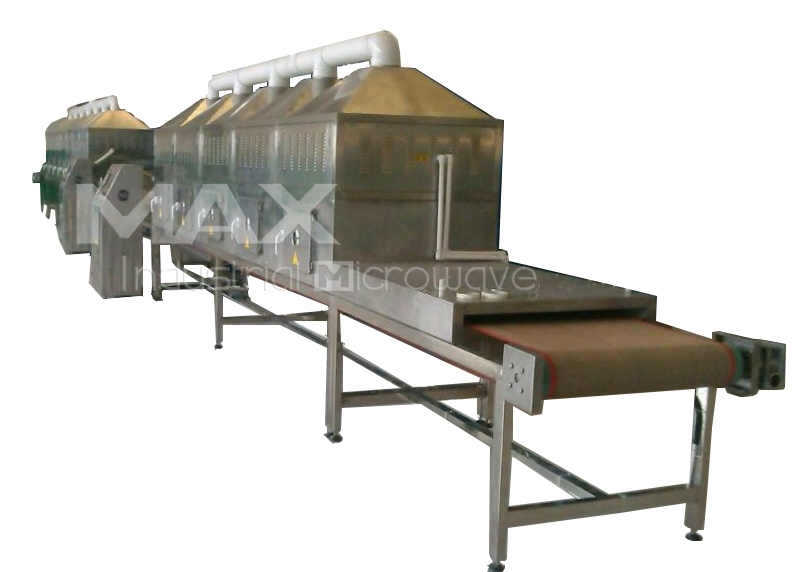 MAX Industrial Microwave offers both batch microwave oven and tunnel conveyor microwave machine.